The new DCC book group got off to a flying start and will be meeting on the third Tuesday of the month from 11am at a variety of venues. The next meeting is on Tuesday the 19th of January at Spoon, Nicholson St, from 11am. Please see the Photo Book Group page for the latest meeting information. Saul Leiter – Retrospective (Haus der Photographie) from PhotoBookStore.co.uk on Vimeo. Are you interested in talking about Photobooks? 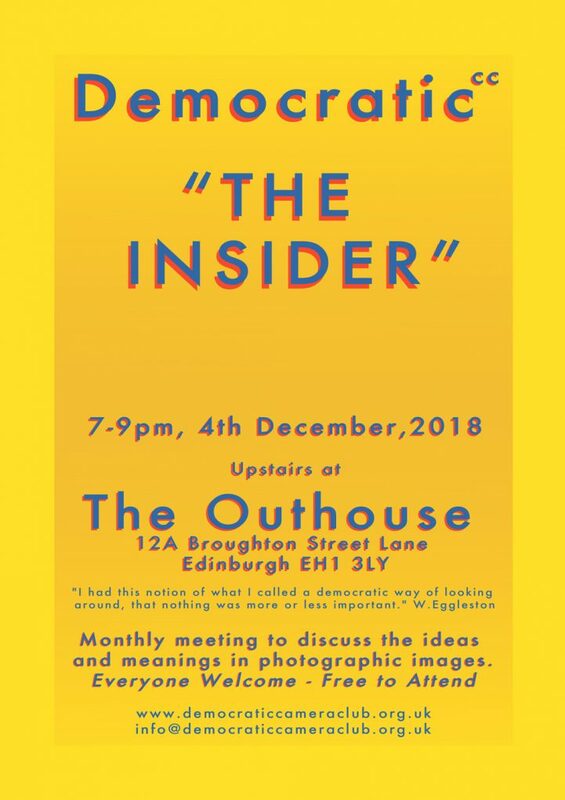 Then come along to the new DCC photobook group. We will be talking mainly about published photobooks, but will no doubt be straying into the territory of making your own photobooks. What makes photobooks work for you? Bring along a favourite photobook and share it with other club members. The first meeting will be in the Casa Angelina on London Street at 11 am on Tuesday December 15th. This months meeting has no theme so please bring in any photography project you are working at and would like to get some feedback on – complete, in progress or even just at the ideas stage. When : Thursday 3rd December 2015 from 7pm. Where : Stills, Cockburn Street, Edinburgh. Please give a suggested donation of £3 directly to Stills to help them maintain the gallery. The next meeting of the Democratic Camera Club will be next Thursday 4th December at Stills with the usual kick-off time of 7pm; try and get there early to bagsie a good seat. December will be one of our biannual Open Evenings where there is no theme for the images. If you are currently working on an ongoing personal project, need some thoughtful feedback on an idea or image, or simply want to gauge others feeling towards your work, then please bring one or a number of images for the group to provide comment and critique.